Is His Name the Origin of the Word "Crap"? Thomas Crapper was an English plumber and industrialist, but he was not the inventor of the flush toilet. The modern flush toilet design dates back to 1596, 240 years before Thomas Crapper's birth in 1836. English patents for flush toilets were issued in the 1770s. Public toilets were installed in England in 1854, when Crapper was just 18. And as for the word "crap", it has been used in English since 1440, based on Middle English crappe which came from earlier Dutch and Old French words, which in turn came from medieval Latin. Toilets have been around at least since 3,500 BC when the Neolithic settlers of Skara Brae on the Orkney Islands off the northern coast of Scotland built toilet chambers at the corners of their stone homes. Those late Stone Age toilets had a drainage system to remove waste, although it is unclear whether they had a true water flushing system or not. 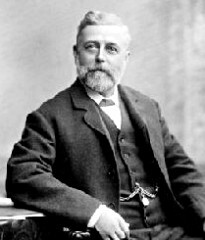 Thomas Crapper, 1836-1910, English plumber and industrialist but not the inventor of the flush toilet. A flushing system connected to a common sewage disposal system existed by 2,600 BC in the cities of Mohenjo-daro and Harappa in the Indus Valley Civilization. 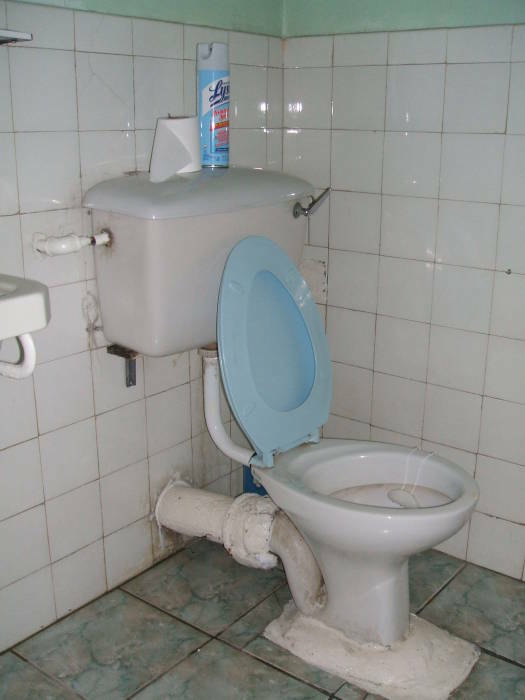 The Minoan civilization on Crete and Thera had flushing toilets by 1,800 BC. The Roman Legions attempting to keep the Picts north of Hadrian's Wall built a series of fortresses complete with military latrines across the narrowest part of Britain, just south of today's English-Scottish border. But as the Roman Empire gradually collapsed and the Roman influence in Britain and areas of western Europe faded away, Roman civilization and its associated plumbing also disappeared. England went back to filling chamber pots and flinging the contents out windows into the streets and, if they happened to be in the wrong place at the wrong time, onto passers-by. Sir John Harington is generally credited with the re-invention of the English flush toilet. He was a courtier of Queen Elizabeth I, a favorite of the Queen when he wasn't giving offense with some of his more risqué poetry. The Queen banned him for reading an especially racy translation of some verses from the Italian epic poem Orlando Furioso, telling him not to return to court until he had finished translating the entire poem. As the original poem has 38,736 lines, making it one of the longest poems in European literature, she thought she had gotten rid of him. Harington's time away from court gave him time to tinker with plumbing at his estate in Kelston. He returned to the course in 1591 with the entire epic translated into English. The Queen had to let him back into her court. And he had done a good job, his translation is still the standard English translation. Four years later Harington dropped a much bigger political bomb with his book A New Discourse of a Stale Subject, called the Metamorphosis of Ajax, ostensibly a description of his newly designed flush toilet but really an allegorical attack on the Queen's favorite (by far) courtier, Robert Dudley, the 1st Earl of Leicester. Harington published this book on his flush toilet invention in 1596, 240 years before Thomas Crapper was born. See the History of Flush Toilets page for far more details on Harington and his invention and scandalous book. Alexander Cummings was a Scottish general mechanic and tinkerer who obtained the first English patent for a flush toilet design in 1775, 61 years before Crapper's birth. Cummings' innovation was an S-shaped double bend in the waste pipe, forming an air lock that kept the sewer gases from coming up the pipe and entering the room. It's the same basic trap design we use today. 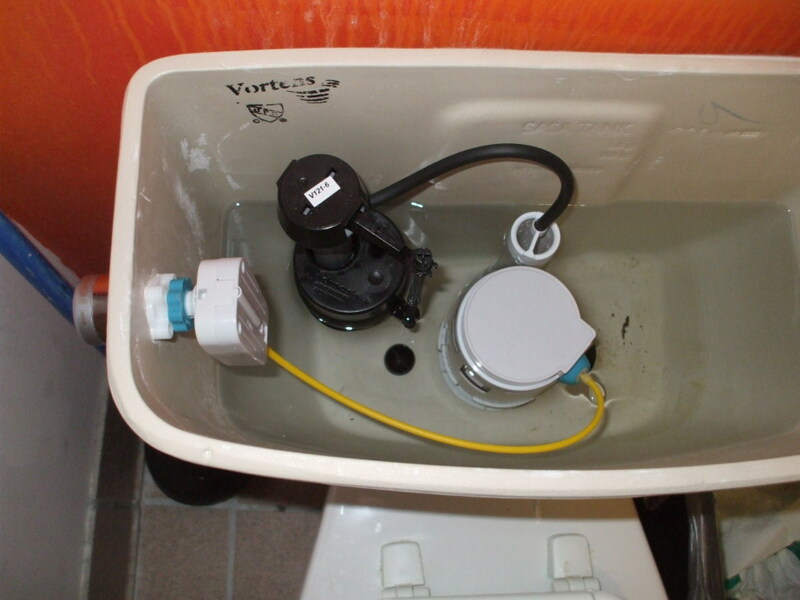 Modern toilet at Pearl's Guest House in Port of Spain, Trinidad, showing a P-shaped trap connecting the toilet to the large horizontal waste pipe. Joseph Bramagh was installing flush toilets built to Cummings overall design with a hinged flap valve developed by his employer. Bramagh's employer had not bothered to patent his invention, so Bramagh patented it in 1778. He set up a factory to manufacture the new design, which was popular well into the 1800s. George Jennings became a plumber with a London firm in 1831. He became famous for prominent large-scale designs and installations like those at the Great Exhibition of 1851 when Thomas Crapper was just 15 years old. George Jennings designed the first public underground toilet at the Royal Exchange in 1854. In 1855 the British Government appointed him the head of the sanitary commission sent to the Scutari Barracks, what the Turks called Selimiye Kişlası, in the Üsküdar district on the Asian side of İstanbul. This was to support the Crimean War medical work of Florence Nightengale, who had asked for him specifically. By the early 21st Century, toilet technology had advanced to the point that dual-flush toilets were common. Thomas Crapper was born in Yorkshire in September of 1836. His precise birthday isn't known, but he was baptized on 28 September 1836. And so, like the American presidents Washington and Lincoln, his birthday celebration is a moveable feast, a week-long period instead of just one day. His father, Charles, was a sailor, so the family had at least some connection to water. Thomas' older brother George became a master plumber in the Chelsea district of London, and Thomas was apprenticed to him in 1853. This was two years after Jennings' famous design at the Great Exhibition of 1851, and just two years before Jennings was sent by the government to assist with Britain's main Crimean War military hospital. By 1861 Crapper had completed his apprenticeship and worked three years as a journeyman plumber. He set himself up as a sanitary engineer, with a brass foundry and workshops along London's Marlborough Road. Thomas Crapper was the first at something toilet-related: Thomas Crapper & Company operated the first showroom of toilets, bathtubs, sinks and other bathroom fittings. Thomas Crapper & Company operated a showroom along King's Road in London until 1966. They were still manufacturing plumbing fixtures along Marlborough Road, since renamed Draycott Avenue. The marketing paid off. Thomas Crapper & Company were given their first Royal Warrant in the 1880s. Queen Victoria had purchased Sandringham Hall in Norfolk in 1862 for Prince Edward, later to take the throne as King Edward VII, and his new wife Princess Alexandra of Denmark. This was one of the arranged marriages of European royalty. That same year her father became King Christian IX of Denmark and her brother was appointed to take the vacant Greek throne as King George I of Greece. Good luck keeping track, one of Victoria's grandsons was Friedrich Wilhelm Viktor Albrecht von Preußen, who became Wilhelm II, the last German Kaiser or Emperor and King of Prussia. King George V of the UK was his first cousin and Tsar Nicholas II, the last Romanov ruler of the Russian Empire, was his second cousin. Anyway, Prince-Edward-to-become-King-George and Princess Alexandra moved into Sandringham Hall in 1863. By 1865 the Prince felt that the hall was inadequately large and he hired an architect to tear it down and build something grander in its place. The result, in 1870, was Sandringham House. Since then it has functioned as a private home for the British Royal Family. Built for the Royal Family, its fixtures were well ahead of their time. It was lit by gas lights, and for its plumbing, Prince Edward commissioned Thomas Crapper & Company to install flushing toilets and showers in the 1880s. This included thirty toilets with cedarwood seats and enclosures. Prince Edward liked Crapper's products and services. He further Royal Warrants to the firm after taking the throne, and these were followed by more from George V when he was Prince of Wales and after he took the throne. Thomas Crapper went one to hold nine patents, three of them for improvements to components of water closet design such as the floating ballcock. In 1863 he invented a self-raising seat. But he did not invent the flush toilet (he was at least 4,500 years too late for that), he did not re-introduce it to England (265 years too late), and he did not lead the mass industrialization of manufacturing modern ceramic toilets. The Thomas Crapper name lives on. Thomas Crapper & Company Ltd. produces the world's most authentic Victorian and Edwardian sanitaryware. Designs of the late 1800s in modern materials, with careful reproduction of the original designs and decorations. What About the Word "Crap"? It seems that the most common version of the urban legend is that U.S. servicemen stationed in England during World War I saw "Thomas Crapper & Co" on toilet cisterns (that is, water tanks) and this led to Army slang: "I'm going to the crapper." No, I'm afraid that Thomas Crapper's name had nothing to do with crap becoming a slang term for excrement. Crap dates back to Middle English. It has generally had a meaning of "rejected or left matter, residue, dregs, dust", and only more recently came to be related to excrement. The Middle English word crappe came from the earlier Dutch word krappe and krappen (meaning "to pluck off, cut off, separate") and the Old French word crappe ("siftings, chaff, waste"), which in turn came from the medieval Latin crappa ("chaff"). Crappe in modern French means "dirt, filth, millstone grease." The Oxford English Dictionary reports the English use of crappe to mean "grain husks or chaff" in 1440 and 1483. In 1669 it was used to mean buckwheat and weeds growing among corn. Examples from 1490 through 1877 use crappins and craps to mean "residue formed in rendering fat." In 1879 crap was used to mean "the dregs of beer or ale." This was when Thomas Crapper & Co was about to get their first Royal Warrant from Prince Edward. Crap was used as slang in the 1700s, meaning "money." "What? Fenced in a crapping ken?" Hotten's Slang Dictionary or 1859 lists crapping case and crapping castle for "privy or water closet." Thomas Crapper was still a journeyman plumber at his brother's firm in 1859.